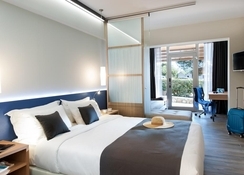 Blue Dolphin Hotel is a large modern hotel that offers all-inclusive, half-board and full-board to travellers looking for a seaside retreat. It features 3 types of rooms, swimming pools, recreational facilities, gym, yoga, animation, mini club, restaurants and bars. Rooms in Blue Dolphin Hotel are divided into Double Rooms, Superior Double Rooms and Family Rooms. All the categories are spacious and well-furnished with air conditioning, fridge, private bathroom, hairdryer, TV with satellite, WiFi internet, telephone, work desk, and huge balcony and window — Family Rooms come with extra sofa bed. Rooms are rich in colour and receive plenty of natural light. Speaking of food and beverages, the hotel features a main restaurant that serves breakfast and dinner in buffet style (also serves wine) and a Taverna, an a la carte restaurant that serves selected Greek and International cuisines. The beach bar, main bar, pool bar and the bistro olives serve a wide range of cocktails, mocktails, healthy drinks and other alcoholic and non-alcoholic drinks. 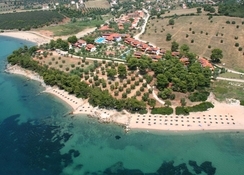 Blue Dolphin Hotel houses two large swimming pools — kids have their own separate pool — sunbeds and parasols are complimentary while beach towel has to be rented. Its recreational facilities also include tennis court, beach volleyball, table tennis, basketball, mini golf, darts, water aerobics, yoga, stretching exercises and gym. It offers a mini club where children between the ages of 4 and 12 can enrol to participate in a wide range of games and activities. And though day and night, the animation team ensures that you have a gala time as you partake in various games and activities. Besides, if you want to pamper yourself, visit the spa that offers numerous beauty and relaxing massages and therapies. 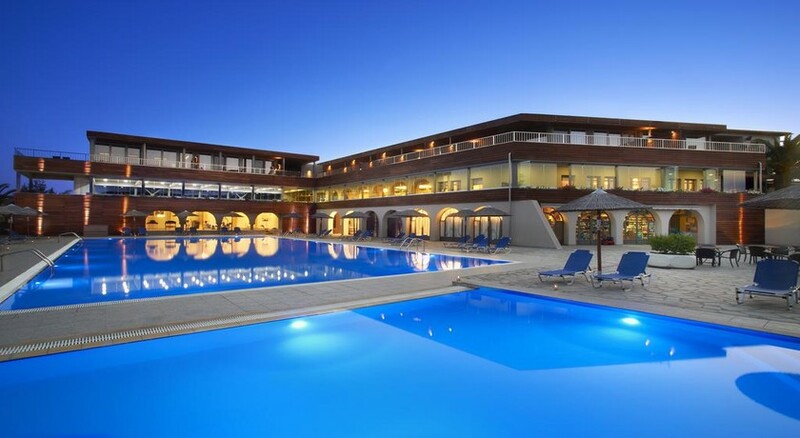 Located in Halkidiki, Sithonia, Blue Dolphin Hotel is a modern hotel celebrated among families, couples and large groups of friends. 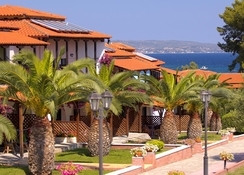 The hotel is situated on Toroneos Bay (the beach is about 50 metres away), amidst a landscaped garden that is full of ornamental trees, greens and herbal plants. There are no shops or restaurants in the surrounding — you have to travel a few kilometres either south or north but there is a souvenir shop in the hotel premises — Sithonia Airport is 18 km away.